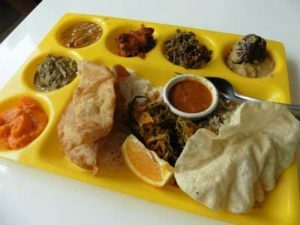 Thali is a traditional Indian lunch, a hearty sampler of vegetarian flavors. Seems not long ago that Charlotte had only a couple of Indian restaurants. That’s changing fast as people from South Asia have become the city’s largest non-Latino immigrant group. Case in point, Madras Cafe. “Some people want pure vegetarian, for keeping a good health,” says Satish Kumar, who arrived in Charlotte in 1998 to do internet engineering. For those South Asians, a restaurant that offers a mix of vegetarian and meat dishes won’t do, he says. So Kumar and partner created Madras Cafe in 2016. Though Kumar himself lives in Ballantyne, they located the eatery in the Mallard Creek area of northeast Charlotte off I85 exit 46B. The locale is known for the annual Mallard Creek BBQ each October. It’s now also home to many upscale immigrants from India and Pakistan. Within two miles of venerable Mallard Creek Presbyterian Church, dating back to 1830, you can find an Indian bakery, Rajbhog Foods, a South Asian butcher who abides by the Muslim holy regulations known as halal, Holy Joe Meats, and half a dozen Indian restaurants. 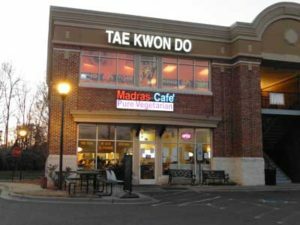 Madras Cafe is located at 3130 Driwood Court, a short street near the intersection of Mallard Creek Road and Mallard Creek Church Road. Madras Cafe offers an extensive menu but at lunch I suggest the thali, a generous sampler. Thali is India’s favorite lunch, usually served on a hand-hammered metal disc crowded with tiny bowls. Here it is fashion-forward on a bright yellow molded one-piece tray. The tray’s biggest niche holds two kinds of rice, white and veggie-tossed, plus two kinds of thin flatbread, poori and papad. The day I visited there were also delightful spinach fritters plus a mini-bowl of chana masala, a savory chickpea stew, to dip the fritters or bread in. Chilli idly, cubes of lentil bread coated in a mild red spice mix. Stewed okra, called bendakaya vepudu in Kumar’s native tongue Telugu, which is India’s third-largest language. Saag paneer, chunks of mild cheese in a creamy spinach sauce. Kesari bath, a sweet dessert made with wheat, nuts, raisin and sugar. It looks and tastes a bit like sweet potato pudding — but no sweet potato is involved. The selection changes every day, more elaborate on weekends. It’s a bargain at $5.99 weekdays, $9.99 Saturday and Sunday. The rich flavors will hook you, even if you are a confirmed meat-eater.